Place the eggs into a saucepan and cover with water. Place the lid on the saucepan and bring to the boil. When the water starts to boil take off the lid and start timing for 8 minutes. Drain and cool under cold water, then peel. Cut the eggs in half lengthways, and scoop the yolks out into a bowl. Place the curry paste into a small non-stick frying pan and cook for about 1 minute, stirring. 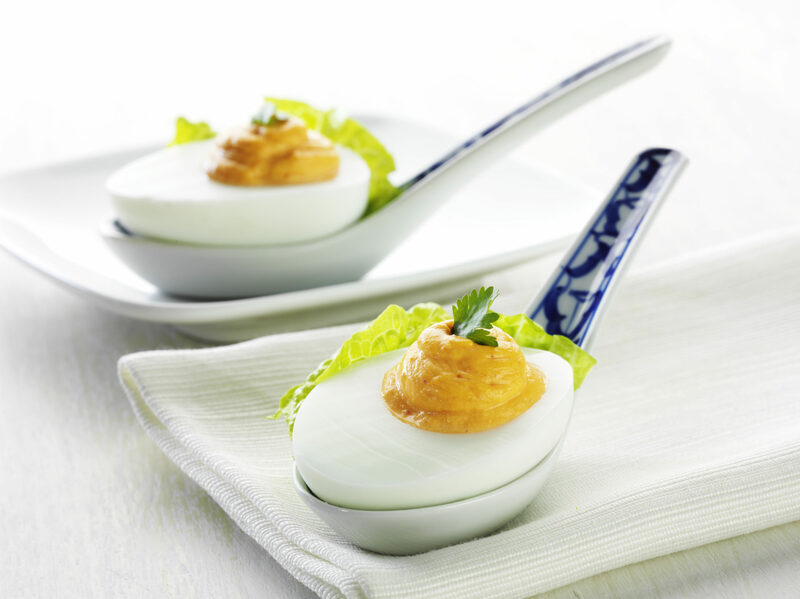 Cool slightly, and mix with the yolks, mayonnaise and lime juice until smooth. Spoon into a snap lock bag, and cut a 1cm hole across one corner. Pipe the mixture back into the egg whites. Sit an egg half on a baby cos leaf, and top with a coriander leaf.